I do not think that we have enough fish consumed in our diet. Don't know why. May be because I grew up in Hong Kong where fish were bought fresh, fresh in the sense that they were alive in the fish tank and killed by fish monger immediately after you bought it. So, I was a bit turned off by all the frozen or previously-frozen fish fillets that sell at the supermarket here. But, we got to adapt to and make the best out of what we have. 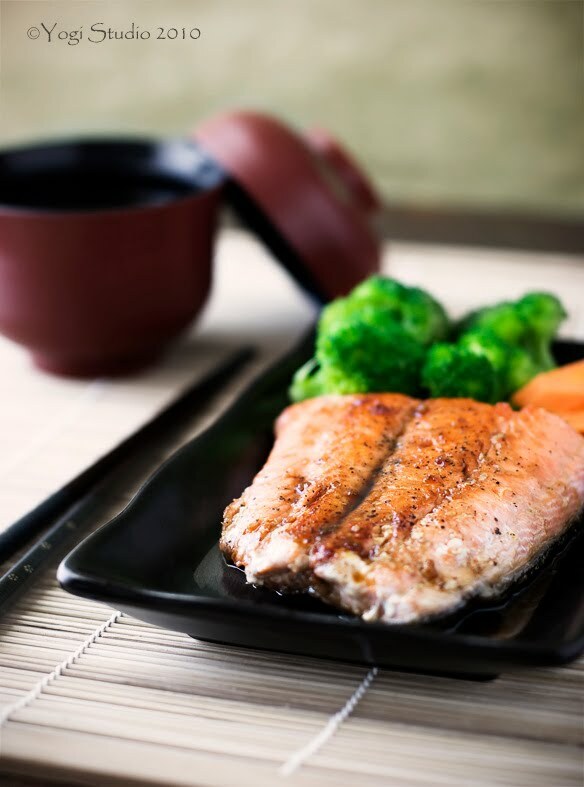 As we have an abundance supply of salmon here and it is one of the most flavorful fish, I always like to try new ways of cooking it. 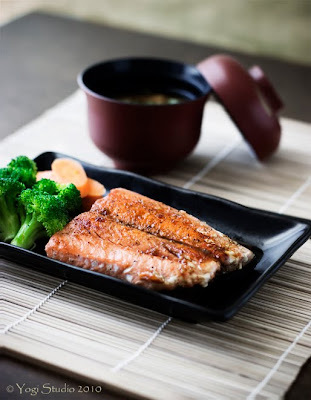 Teriyaki salmon is one of my favorite salmon recipe. This is a quick and healthy dinner. I always make the teriyaki sauce ahead of time and store it in an airtight container in the fridge. It can last for a few weeks. Besides salmon, I also use the sauce on grilled or broiled chicken thighs and on vegetable. Put soy sauce, sugar, grated ginger, minced garlic in a small saucepan. In a small bowl, mix mirin with cornstarch until the cornstarch is dissolved with no large lumps. Stir cornstarch mixture into the saucepan. Bring the mixture the a boil over medium heat and then reduce heat to low for simmering. Stir occasionally and cook until the mixture is thickened, about 5 to 7 mins. Adjust consistency of the sauce to your preference by adjusting the simmering time. I like eating the skin as well. So, I usually season both sides of the fillet with salt and pepper. Add oil to the cast iron pan, swirl to coat the pan. Heat oil over medium heat until it is hot but not smoking. Put fish fillet in the pan, skin side down. Pan fry the fish for about 3 to 4 mins (depending on the thickness of the fillet) until the skin is golden brown. Flip over the fish, pan fry the flesh side for another 2 to 3 mins, until golden brown. Remove fish from the pan and pour about 1 Tbsp of teriyiki sauce on top of the fish. Serve. 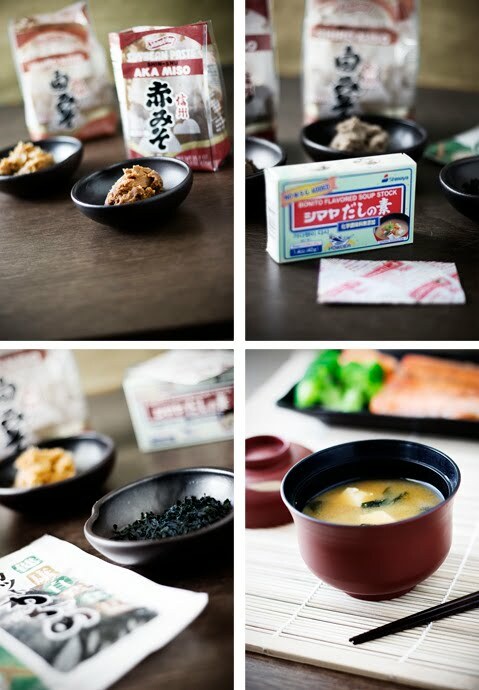 To make it a complete Japanese meal, besides serving the teriyaki salmon with rice, I also like making miso soup. It is so easy to make miso soup when you have the right ingredients in your pantry and it is so much better than the over-salty soup in the average Japanese restaurant. Red miso is stronger and saltier in flavor while white miso is milder. I like to mix both of them. You can pick either one to suit your taste. Using bonito powder to make the dashi soup base is a short cut step. Since I found out that even my Japanese sister-in-law is doing it this way, I did not bother making the soup base from scratch. But someday I will try! Add bonito powder to water. Bring water to a boil over medium heat. Add tofu and mushroom, bring to a boil. Reduce heat to medium low. Add miso paste. Stir occasionally and simmer until miso paste is dissolved, about 2 to 3 mins. Add dry seaweed, cover and simmer for another 1 to 2 mins, until seaweeds are softened. Serve hot. yum!!!! who knew teri sauce was so easy to make?! Tia - You'er right. The teriyaki sauce is super easy to make and it's much better that the bottled ones. Try it out! 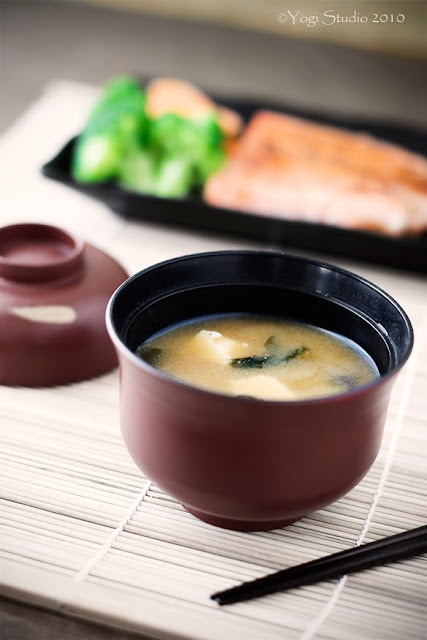 I love miso soup, I'm going to try this tomorrow. Dana - Sometimes i also put in different ingredients like a few pieces of clams, small pieces of fish and make different version of miso soup. After you try it, please let me know if you like it. Two of my most favorite foods, together in one spot. Lovely.